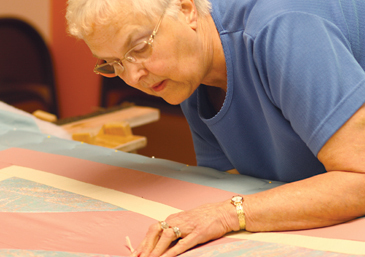 Pearl Uhlir works alongside her fellow quilters, the Zion Quilters group, at Zion Lutheran’s Fellowship Hall. From an outsider’s perspective, the hours she spends crouched down threading yarn through their latest creation may appear tedious and uncomfortable. However, Pearl doesn’t see it that way. She is proud; proud of the beautiful quilts she crafts with the women who have become her friends, and even more proud of the impact these quilts have made in her community. With a beaming smile on her face, Pearl shares that their group donated 152 quilts last year, many of which went to Hospice of the Red River Valley patients. The group treasures hearing how their quilts are received like warm hugs. They chose Hospice of the Red River Valley upon Pearl’s recommendation. She had experienced Hospice’s compassionate care first hand when her husband LeRoy was in his final stages of cancer. Her quilting is a labor of love – a fitting tribute to her dear husband and friend who valued the care he received from Hospice so much that he requested his memorial donations be given to continue their important work. Thoughts of LeRoy are often close by as she quilts. Pearl remembers his happy spirit, their years together and how hard he fought his battle against cancer. Diagnosed in December of 2006, LeRoy did everything in his power to fight the disease while still living life to its fullest. He sought aggressive chemotherapy treatments at Innovis Health and consulted with the Mayo Clinic. Yet, he also took time to really appreciate Pearl, even hosting a surprise party for her while he was in and out of the hospital with his cancer treatments. His strength and courage never ceased to amaze her. In the spring of 2009, they were on vacation in Texas, when Pearl began to see changes in LeRoy. She noticed he was getting more and more tired. So with LeRoy’s permission she bumped up his appointment with Dr. Henke, his primary physician, upon their return to Minnesota. The report from Dr. Henke was not good, LeRoy’s tumors were growing. Upon hearing the news, LeRoy made a definitive decision, he was done fighting, “I am so sick and tired of all this. I am not going back to the hospital.” Hospice was called that morning and was there to help by the afternoon. Today, Pearl honors LeRoy by continuing his memorial donations through her work with the Zion Quilters. That is why she proudly shows up each week, crouched down, threading the yarn, doing her part to build the next quilt for a cause.